The idea for Papillon was born when Halvorson was working to construct a microwave tower for AT&T on the Echo Summit in the Sierra Nevada. During the project, he purchased a helicopter to carry workmen and light construction materials back and forth over the Grand Canyon. Halvorson built the company from the ground up and ran it without help from his family until his daughter Brenda joined the company in 1986. Just seven years later, she was promoted to president and CEO. When Brenda joined the Papillon team, Halvorson promised himself he would give his daughter leeway and offer his advice when she asked for it. Though the company turned into a family business, the opportunity to join the team didn’t come easily. 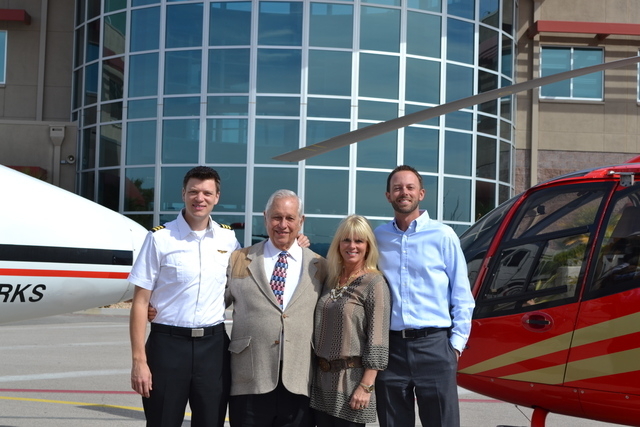 According to Brenda, every family member was in their mid-30s before joining the company, including her son Geoff Edlund who became the general manager of the Nevada Helicopter Operations for Papillon in January 2012. “What I wanted for Geoff was to realize that he didn’t need the family business to be successful and that he could do it on his own,” Brenda said. Before joining the family business, Edlund was in real estate in Seattle. Brenda’s nephew, Jake Tomlin, also joined the company in April 2013 as the general manager of the Nevada Fixed Wing Operations. When Jake and his wife made the decision to resign from the Marine Corps, Brenda invited him to check out the company. According to Halvorson, it’s important in a family business to trust family members and let them make mistakes. Though there are no definite plans to add any more family members to Papillon, the Halvorson family said they’re looking forward to seeing what the future holds.